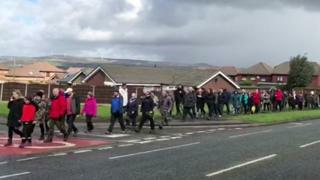 Hundreds of people joined a demonstration against plans to build on green sites in Greater Manchester. Sunday's Bury march, in which about 700 took part, was the latest in a series of protests against plans for 201,000 new homes in the region by 2038. Green belt land, which forms 47% of the city region, would be cut to 45% if the Spatial Framework plans are approved. Greater Manchester Combined Authority (GMCA) said a public consultation into the plans closes later on 18 March. Earlier this month, 4,000 people marched against the plans in Oldham. The GMCA revealed its Spatial Framework plans in January. An earlier plan, published in 2016 for 225,000 new properties, drew huge protests across the region and 27,000 responses in a consultation. The GMCA says the new plan "is based on an anticipated population growth in Greater Manchester over the period of the plan of 250,000 people".